Cool Cats aims to help dancers of all makes, shapes, and sizes Take the Next Step in their dance journey. We understand that for some this will be a social pursuit, while for others it may be a matter of personal achievement, or include active participation as a sport. Consequently, our classes are offered in a variety of lesson formats that allow dancers of all levels of experience to learn the dance styles they prefer in accordance with their interests and ability. It is Cool Cats intent that students receive the best possible options and opportunities to expand their dance experience. Dance solely with your partner, participate as a group, or chose to do both! Whether you’re looking for a casual social activity or serious sports training, Cool Cats combines quality dance instruction with great music, great people, and a great time. Cool Cats also recognises that dancing quickly becomes no fun when you feel like you can’t keep up or you “just can’t get it”. We believe that each dancer should be encouraged to progress at their own speed and level of confidence; no-one should feel required to achieve a certain standard or to “keep pace” with a peer group. Our classes therefore allow for optional levels of group participation, with personalised instruction ranging from occasional input to regular tailored guidance. Every dancer should feel welcome and enjoy coming to class. All dancers begin as students, and we understand that it is not always easy to learn a new style, a new dance technique, or sometimes even turn up to class. Cool Cats intends that all dancers should feel appreciated for the effort they put in to improve their dancing. Especially when committed to serious dance training, students should find that the constructive feedback provided remains relatable, accessible, and understanding. 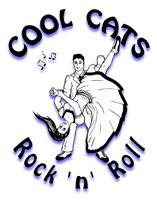 In addition to what happens on the dance floor, Cool Cats continues to look for opportunities to socialise, support the broader Rock ‘n’ Roll community, and generally help students participate and get to know each other. We keep our classes relaxed and flexible so that everybody can take some time out to greet friends – or make new ones. While it would nice to be able to put the world on hold and just dance, unfortunately life rarely runs according to plan and it is often difficult for students to make it to dance classes. For some people it is a non-issue – dancing is what you do and you just do it; but for most people the capacity to work to changing schedules or to miss a class or two (without feeling left behind) is a great advantage. Similarly, each dancer is an individual and the pace/style(s)/content preferred by one student during a lesson may be greatly different to another’s. Cool Cats aims to help every dancer develop their dancing in the direction and to the level that they wish to achieve. To that end, one type of lesson simply cannot meet the needs of all. 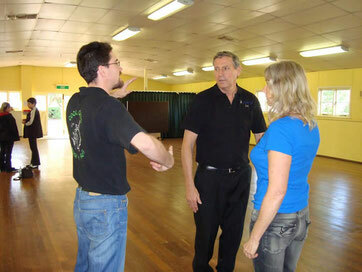 Cool Cats offers Sunshine Coast's largest selection of 'nostalgia' dance styles. Combined with a variety of lesson formats and payment structures, we provide the best possible options so that students can find both the right type of dance and lesson balance for them. Cool Cats recognises that, for most people, dancing is primarily a social activity. However, we believe that every lesson should help you perform or understand your dancing better. Cool Cats is not content to simply go through the motions – we want every dancer to walk away from a lesson with improved skills, more confidence, and a greater appreciation for the dance. You’ll never be under pressure to do more than you’re comfortable with; but we simply aren’t doing the best we can if we are not trying to help you improve and/or expand your dancing. Cool Cats provides dance instruction in a logical and structured manner. Students are directed through the foundational elements of a dance style, with a clear progression of skills and methods to provide a consistent framework to facilitate understanding and implementation of dance elements of increasing difficulty/complexity. Cool Cats also provides regular short courses and training sessions to allow experienced dancers to continue to improve their dancing.